We are only two days away from our Kicking Bear Camp – West Salem 2018!! We are very excited to see everyone there. If you still have not had the opportunity to sign up, or register to volunteer you still can!! You do not want to miss out on all our fun activities including archery, slip n slide, games, and prizes. Follow the link below to register. This month we feature a story written by Michael Ritchie, a man that helped out with a Kicking Bear Camp in Roscommon MI. Michael was able to be apart of two baptisms and witness the love for the Lord that two girls gained. In the movie “Gettysberg”, General Meade asks Buford (Sam Elliot) if this is a good place to have an army. Buford’s reply was” It is very good ground, sir” The entire Southern army was on their way and Buford had just spent every effort holding the high ground for the slowly arriving Federal troops. They would have the advantage over General Lee’s Confederates. It was the deciding factor in the outcome of the war. Soon 100-180 people would be converging on Bambi Lake Baptist Conference Center to Shoot 3-D archery, toss tomahawks, compete in tug of war, swim, have a massive marshmallow war, and have a pizza and ice cream party. After tearing it up all day, the kids would listen as Ray shared how God had changed his life. Giving the invitation that night, we saw a number of hands go up indicating that many kids had made a decision for Christ. We told the crowd that the next day we would hold a Centershot/NASP style tournament, have lunch, give out medals, and host a baptism for anyone who was interested. Two young girls came up to us and asked if they could be baptized in the moon light that was majestically shining over the lake right then. “We are leaving tomorrow to go to China for a year and we want to be baptized before we go,” they said. “We can’t stay for the tournament tomorrow.” We prayed about it and I asked them if they could be at the lake at 8:30 am to be baptized the next morning. Their parents assured us they would be there. As the rest of the group was finishing up with a continental breakfast the next morning, Ray and I went out to the lake and met with the two girls and their parents. The mother gave a beautiful testimony on how God told her in a dream that there was a little girl in China was calling out to her and her husband “please adopt me”. She awoke in a cold sweat and told her husband God wants them to adopt a Chinese orphan. “That was our first daughter,” Her husband said. Then the mother went on to tell how shortly after the first adoption she had another dream. “That was our second daughter,” her husband filled in. She went on to say they would be going back to China to be missionary “Teachers” for a year. Ray and I baptized the two girls and later realized that we were sending off four missionaries to China. We had had the privilege to have a part in what God was doing. Several others were baptized later in the afternoon. It had indeed been good ground to fight a battle and the water wasn’t bad either! If you are wondering how you can have a part in what God is doing though Kicking Bear Camps and Centershot, head to their websites www.Kickingbear.org and www.centershot.org. 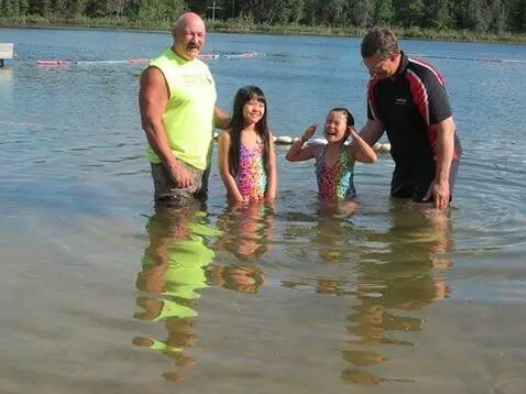 The young girls were given the opportunity of a lifetime, to participate in a Kicking Bear camp and become baptized by their own wises, while their mom shared a beautiful testimony on the ways that the Lord works in our lives. This family of four was sure to share the word of the Lord with those they were to meet and see in china that next year.